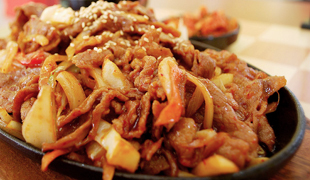 Kimchi has become the icon of Korean cuisine, as well as Korean culture. It is made of salted cabbage or radish, which is seasoned with chili powder, green onion, and garlic and then fermented. Kimchi is known to have an anti-cancer effect. Kimchi is good for preventing cancer and the hardening of the arteries, as well as helping you to stay in good shape and have smooth skin. Much attention has been focused on kimchi in the past due to its beneficial and healthy effects, such as its nutritional balance; activation of the metabolism; and the prevention of obesity and various adult diseases, which include high blood pressure and diabetes; and new types of infectious diseases, which are caused by viruses. The main ingredients of kimchi are radish and napa cabbage. They are seasoned with garlic, green onions, ginger, red pepper powder, salt, and fermented fish sauce. To make tasty kimchi and ensure that it will be well preserved, it should be stored at constant temperature of around 5℃. 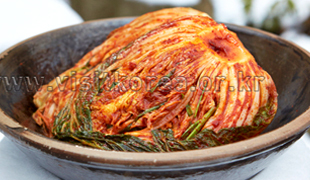 This special type of kimchi is usually made between the spring and summer. The crunchy texture of cucumber and refreshing kimchi juices enhance the flavor of this kimchi. Slice each seedless cucumber lengthwise, and stuff the cucumber with the seasoning. Compared to other varieties of kimchi, this kimchi gets sour fast and it cannot be used to make soup, so do not make too much at once. To get a refreshing flavor, do not to use fish sauce. Chives are usually used to make the filling, but chopped salted cucumber scraps are used as filling for court cucumber kimchi. Ganjang gejang is a variety of Korea’s unique jeotgal (Salted Seafood). To make ganjang gejang, a boiled and chilled seasoned soy sauce is poured over thoroughly-cleaned crabs. Crabs caught in March and April are best for making ganjang gejang , and female crabs, which has a round apron, are considered good. Female crabs have tender meat and do not have a strong fishy smell. They have a good flavor as they contain a lot of roe. 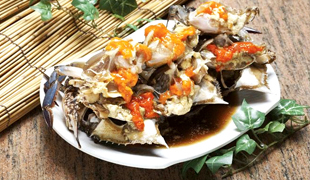 To prepare ganjang gejang, clean the crabs using a brush under running water, remove the apron, open the top shell (carapace), and remove the gills to prevent food poisoning and a fishy smell. Cut off the end of the legs to allow the seasoning to soak into the crab. If the crabs are marinated in a boiled and chilled sauce repeatedly for a 3rd and 4th time, they can be preserved for a longer period of time. Korea is surrounded by the sea, so a wide variety of seafood is abundant. Koreans have been making jeotgal from early on. Jeotgal can be eaten as a side dish, and there are numerous varieties of jeotgal. To make jeotgal, mix seasonal seafood with salt, put the mixture in an earthen jar, add more salt on top, and tightly seal so that it can ferment. Shrimp and anchovy jeotgal are usually used in the making of kimchi. Spicy oyster, small crabs, and squid jeotgal are popular side dishes. 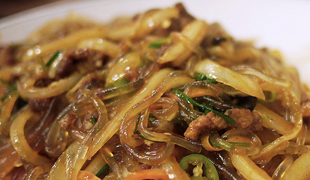 Japchae is Korea’s popular party dish. It is made with various vegetables and meat, which are flavored with seasoning. Vegetables, mushroom, meat, and spinach are seasoned with salt and stir-fried in a pan to make japchae. Cook some glass noodles and flavor it with soy sauce, sugar, and sesame oil and stir-fry the noodles. Mix the vegetables and noodles together before serving. If the noodles are cooked in boiling water, they may soften and stick together as time goes by, so some people recommend that you soak the noodles in hot water and stir fry them instead. As each ingredient is stir-fried in oil, this dish ends up with using a lot of oil. As such, there is no need to add oil when stir-frying all of the ingredients. The word jeyuk means pork. 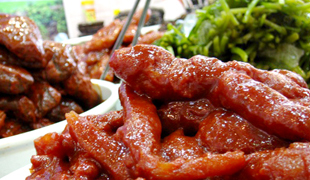 To make jeyuk bokkeum, cut pork neck meat into bite sized pieces, marinate the meat in a red pepper paste seasoning with a lot of ginger juice, and stir-fry the marinated meat. The meat itself has a lot of fat, so use a little bit of sesame oil. Cook the meat over a medium heat to fully cook it without burning the seasoning. While stir-frying, do not cover the pan with a lid. Too much moisture may make the meat and vegetables soggy.